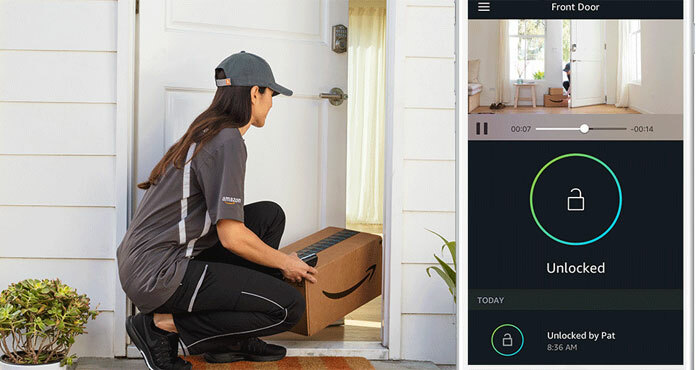 The Amazon Key service works with Amazon's new internet-connect Cloud Cam security camera and your smart lock to let the company's delivery drivers leave packages inside your home rather than on your doorstep. To use it, you simply select in-home delivery as the shipping option. When the delivery driver arrives at your home, Amazon authorizes the delivery, unlocks the door and turns on your Cloud Cam to record the delivery. You'll get a notification on your smartphone the morning of the delivery with a delivery window and another notification when the delivery driver arrives, so you can watch live when your package is delivered. When the driver leaves, your door will lock and you'll get another notification saying the delivery was completed. The service only uses Amazon's own delivery drivers, who have to be in the right place, at the right time, with the right package before Amazon will unlock the door for them. Drivers have to knock before entering, and they won't open the door more than necessary to set your package inside. The Cloud Cam — which must be positioned near the door for the service to work — allows you to verify that nothing's amiss. While Amazon Key is only for package delivery now, Amazon wants to make it available to services, too, letting housecleaners and dog walkers use Amazon Key to get into your home when needed. The only question is whether you trust Amazon to have access to your home. Considering how much access Amazon and other smart home companies already have to our homes, Amazon Key isn't such a big stretch. Whether you use Alexa, Google Assistant, or Siri, there's a good chance you have a voice assistant in your home that listens to everything you say. 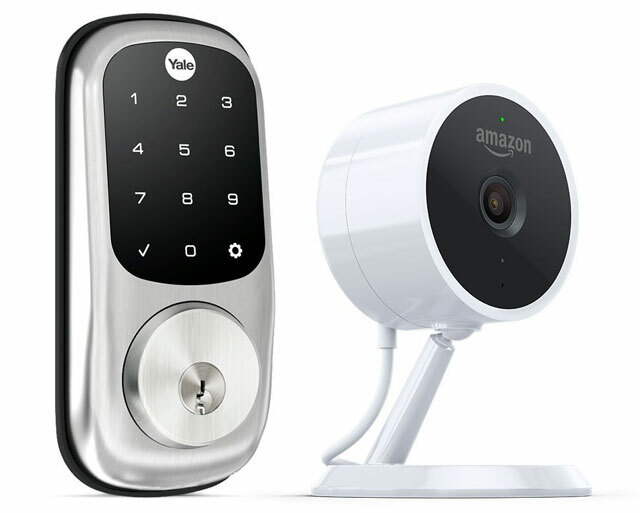 You may already have a connected home security camera or smart lock that do much the same thing as Amazon Key — just without Amazon as the middle-man. Amazon isn't even the first company to give in-home delivery a try. Walmart has been testing in-home delivery in partnership with smart lock provider August and delivery service Deliv. The innovation of Amazon Key is connecting all of these smart home components with Amazon to create a simple in-home delivery system. If you're ready to sign up, you can order an Amazon Key In-Home Kit that includes a Cloud Cam and a supported smart lock for $250. You can choose to replace your deadbolt with a Kwickset 914 Smart Code or a Yale Assure lock. Or, you can select the Kwikset Convert, which works with your existing deadbolt (you'll need to check compatibility). The Cloud Cam ($120, with discounts if you buy more than one) is a straightforward internet-connected camera, with 1080p resolution, night vision, two-way audio, Alexa voice control, and motion detection. The camera keeps an eye on the interior of your home 24/7, and lets you watch live footage as well as review the past 24 hours. Like most smart home security systems, an added subscription gives you access to more footage and adds person detection as well as the ability to configure zones for the camera to watch and set up person detection. The extra layer of security (and accuracy) will set you back $7/month for 7 days, $10/month for 14 days or $20/month for 30 days. Both are available for pre-order now and will ship on November 8. Even if you trust Amazon to open the door to your home, Amazon Key isn't available everywhere. The service launches for Prime members only on November 8, but only in 37 cities nationwide. Amazon plans to expand the service, but there's no word yet on where it will go from there.